Ideally, when building a garden room, you will have easy access from the road to the area in your garden where your new room will sit. Unfortunately, this is seldom the case. Luckily garden room suppliers have designed their buildings so they can be transported in sections along narrow, wavy paths, through gates, etc. But, what if you live in a terraced house with no direct access to your garden, what are your options? Over the years people have told us they didn’t think they would be able to buy a garden room because they had no direct access to their back garden. Others have suggested that their only option would be to have the building craned into their garden over the house, at considerable expense. Luckily there is another option, which with a little effort and not too much expense can facilitate the building of a garden room in a terraced house. eDEN Garden Rooms were recently commissioned to design and build a garden room at a terraced house in Hither Green, London. As with many terraced houses, there was no direct access to the garden, so the eDEN Garden Rooms team had to design the components of the building so that they could be walked through their customer’s house. This isn’t as disruptive as it might sound. A site visit is essential in these circumstances so that both you and the garden room company have a clear idea of what is involved in the process. Your supplier will be able to advise you on the size of the materials they will need to move so that you can make some preparations in advance, such as clearing the path through your house of furniture obstacles and moving ornaments or pictures which might be vulnerable to damage. We know that some garden room firms will protect the floors before they start moving materials, and it is certainly a good question to ask your chosen supplier during the site visit, to ascertain what measures they take to protect your home. As with many urban gardens, space was at a premium for this project. The eDEN Garden Rooms team designed a garden room that would fit tightly within three boundaries at the end of the garden. Under the Permitted Development rules a garden room that is no taller than 2.5 meters can be built without the need for a Planning Permission application. This ruling comes into its own in situations like this. If you can’t build under the Permitted Development rules, you may still be able to build tight to the boundaries like this with the help of a Planning Application. 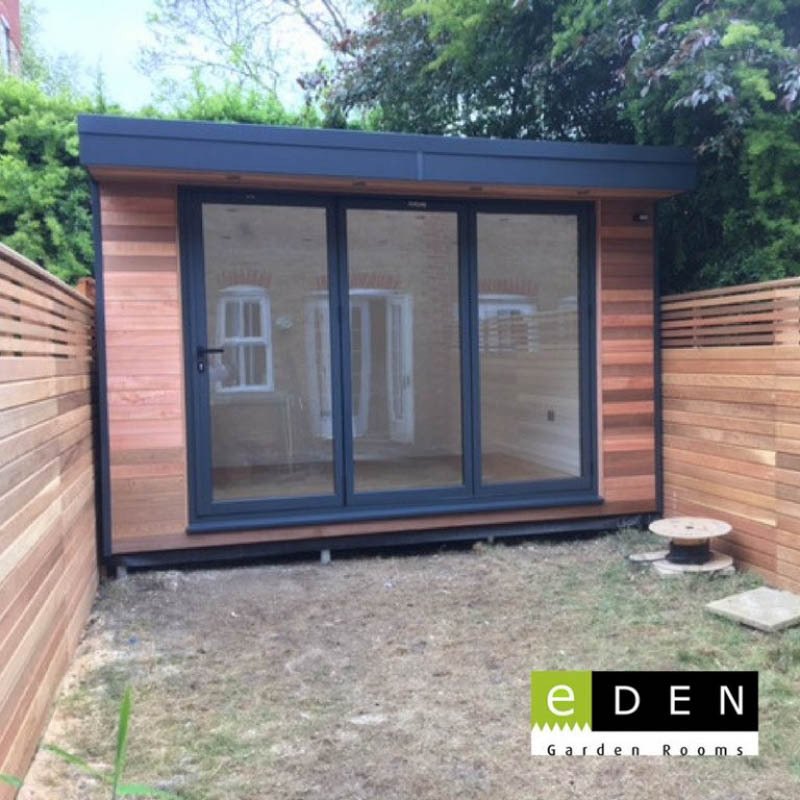 Specialists like eDEN Garden Rooms will advise you on this during your site visit and often handle any application process for you. Building tight to each of the three boundaries the eDEN team have been able to create a garden room that is 3.7 meters wide by 3.3 meters deep – so a good size. The room feels especially spacious thanks to the set of bi-fold doors which will virtually open up the front elevation on to the garden which is going to be landscaped. Creating a real inside-outside room. eDEN Garden Rooms offer a turnkey service for their clients, meaning they handle everything from start to finish. With this project that included removing an old shed from the garden as well as shrubs that would have been in the way. Screw-pile foundations were installed and the room built from scratch with the materials that were walked through the house. This complete project took a modest six days to build. To learn more about this project and how clever design and planning can overcome access problems when building a garden room talk to eDEN Garden Rooms on 0800 0935 339 or take a look at their website.